The Compulsive Reader: Cover Talk: The Haunted Cover! Last summer, The Hollow by Jessica Verday came out and caused a bit of a stir. 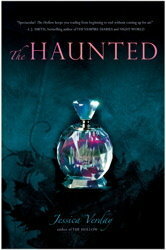 Today I discovered the cover for the sequel, which is apparently titled The Haunted. I like it better than The Hollow's cover, what do you think? I think this has a more sophisticated look, and I just love the colors used! The Haunted will be out in August. I like it a lot. It's very pretty. This is a beautiful cover. I love the simplicity of it. Even though I liked The Hollow's cover, the model was a little scary looking. Too much eye make up or something. I like this cover and the colors but I think I liked The Hollow's cover better.